Rechargeable ‘Eye’ on your Purge! 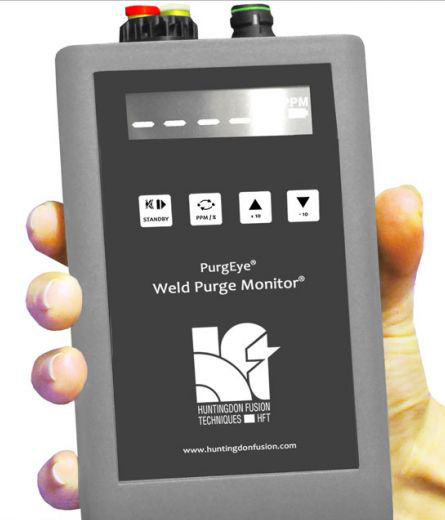 There is an important new addition to the PurgEye® Family of Weld Purge Monitors®. The PurgEye 200 is the first hand held PurgEye® model that can read down to 10 ppm. While most Parts Per Million monitors are table-top models that require a power outlet, the rechargeable battery operated and hand held PurgEye® 200 is an excellent model for use on construction sites where high purity tubing or pipe is being welded. This high-tech Weld Purge Monitor® has made several breakthroughs in design and development technology in Weld Purge Monitoring. PurgEye® is a Family Series of Weld Purge Monitors®. With a large, easy to read alpha-numeric LCD screen, the Argweld® PurgEye 200 Weld Purge Monitor® measures very accurately from 1000 ppm down to 10 ppm. The PurgEye 200 has many great features such as multi-function power on/off with standby button for sensor warm up with auto power-off after 15 minutes as automatic sleep mode, electro-mechanical internal pump with 1 L/min flow rate with an easy on/off facility. The instrument comes complete with warning alarm levels between 1 and 999 ppm, alarm + and – buttons for displaying threshold settings, alarm mute where desired, flow detection for accurate reading of gas samples, leak tight quick connect/disconnect exhausting gas hose connections as well as a safety lanyard for wrist or neck. The Argweld® PurgEye 200 Weld Purge Monitor® Gas has been specifically designed as a rechargeable and portable Weld Purge Monitor® for indicating low oxygen levels in inert gas for weld purging applications that require accurate readings down to 10 PPM. The PurgEye 200 has been specifically designed to be rechargeable battery powered. If the PurgEye 200 is left with an over-range reading for more than 15 minutes, then it will automatically turn off to conserve battery power. The warning alarm can be set to any level between 1 and 999 ppm and has both audible and visual indication when the alarm threshold is exceeded. The flow warning exclamation icon will be displayed whenever the flow of sample gas drops below the minimum flow rate required for an accurate reading. Please note, this could be due to a blocked filter in need of replacement. The large LCD screen allows the reading to be easily read and helps conserve battery power compared to other display technologies. If the PurgEye® 200 is off, then pressing the standby button will switch it on and it will start the sensor warm-up procedure. The PurgEye® 200 can be turned off by holding the standby button for approximately 10 seconds or until it turns off. With the PurgEye 200 switched on and the alarm inactive or muted, pressing the standby button will turn the integral sample pump on and off. If the alarm is sounding, then pressing the standby button will mute the alarm, subsequent presses will control the sample pump. Pressing either of the alarm buttons will display the current alarm threshold setting. When the alarm threshold is displayed, the first digit will flash, pressing either of the alarm buttons at this point will increase or decrease the value of the flashing digit. Weighing only 400 gms (without batteries), the instrument is really lightweight and easy to use all day long. The PurgEye 200 Weld Purge Monitor® indicates oxygen levels from 1000 PPM down to 10 PPM (0.001%), so use an Argweld® PurgEye® Weld Purge Monitor® for guaranteed accuracy of oxygen indication to allow a weld start with minimal risk of oxidation. The ArgWeld® PurgEye 200 Rechargeable Weld Purge Monitor® can be used with any tube or pipe weld purging system, any weld purging chamber or weld purging enclosure. The PurgEye 200 Rechargeable Weld Purge Monitor® can be used as a continuously reading instrument with free flow of the purge exhaust gas across the sensor, or as a sampling instrument with the integral electro-mechanical vacuum pump. The Argweld® PurgEye 200 Rechargeable Weld Purge Monitor® has been specifically designed to be rechargeable battery power operated. It contains 4 standard rechargeable AA batteries and is supplied with a rechargeable battery unit and charger. The large alpha-numeric display is easy to read and can be easily switched to display readings in ppm or percentage. The Argweld® PurgEye 200 Rechargeable Weld Purge Monitor® has a working temperature between 0 and 70°C (32 and 158°F) and a two minute warm up time. Note: Use only 6mm OD polyurethane weld purge tubing. The leak tight quick fit couplings are specifically integrated so that the user will not have leaks of air into the critical purge zone. Do not use other tubing because it will not fit properly and it will cause leaks. The PurgEye 100 Weld Purge Monitor™ can be used as a continuous measuring device throughout the process or as a sampling instrument for spot checks. Visible demonstrations and routine inspections for quality control are made simple. The monitor can be used with any pipe purging system or argon welding enclosure. It is very compact and completely portable.